DIY - Adult Spelling Bee fundraiser! select three parents to represent them either individually or as a team. Set an entrance fee per team. The teams are responsible for getting sponsors to pay the fee (let them see what the kids have to go through). Allow multiple teams per class to raise additional funds. Recently, Fort Madison Habitat for Humanity in Iowa held a fundraiser for the 6th Habitat house to be built this Fall 2007. The fundraiser was an Adult Spelling Bee that raised over $2200. The money was raised through local businesses and individuals sponsoring an adult 21 years of age or older to be a contestant in the adult spelling bee held at a local establishment. The entry fee was $50 and the sponsor of the entry was advertised at the event on a name board and also thanked in a letter to the editor of the local newspaper. Other area sponsors were participants in the giving of prizes for both the winning sponsor and winning speller. We used words found on spelling word websites and also terminology from all areas of expertise represented by the sponsors that gained entry into the competition. This was the first annual and it was a great success for both Fort Madison Habitat for Humanity and the sponsors, along with the establishment where the event was held. Do you know what an engraver’s needle beveled to an oval at the ends is called? St. Mary’s Church, Franklin, Massachusetts, spelling team does. They correctly spelled “echoppe” to win the sixth annual Franklin Education Foundation Adult Fundraising Spelling Bee. Between the 40 spelling teams, silent auction, raffle, private donations and refreshment sales, the spelling bee raised approximately $15,000. Contestants had to spell words from the 2003 Paideia booklet which are made for kids spelling but are uncommonly hard. The first few words in each round were fairly simple. If you are still up there after five or six words, all bets were off. 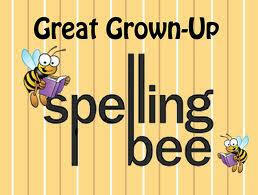 Want some specifics on adult spelling bees? Try the National Spelling Bee site!